We are manufacturer and exporter of chess set in variety sizes, board and chess table. We have standard chess in ordinary size and design. 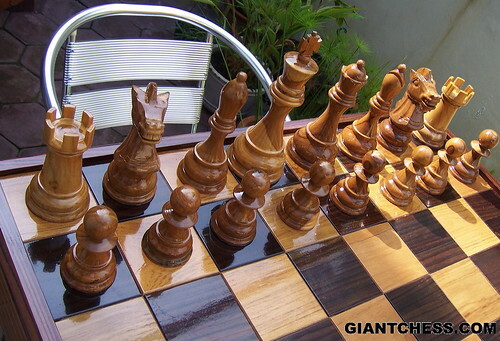 Beside that, we also provide big and giant chess set that usually use for outdoor game. Kids and adolescent love this kind of chess. Then, to explore the chess design, we introduce you to decorative chess, which designed in different form. For example we take an empire theme for our decorative chess like "Scandinavian Chess Set". It describe about important people in Scandinavia Kingdom. We still have many more of chess pieces with different design and form. This time we show about our chess standard. Made from Teak wood and polished well in brown or natural wood color. Those brown chess pieces againts black chess pieces on the board. This standard chess set usually use for indoor play and for beginners player. Those chess pieces are easy to learn and easy to remember.